Two modes of transport travel along the Cob at Porthmadog on 2 June 2012. 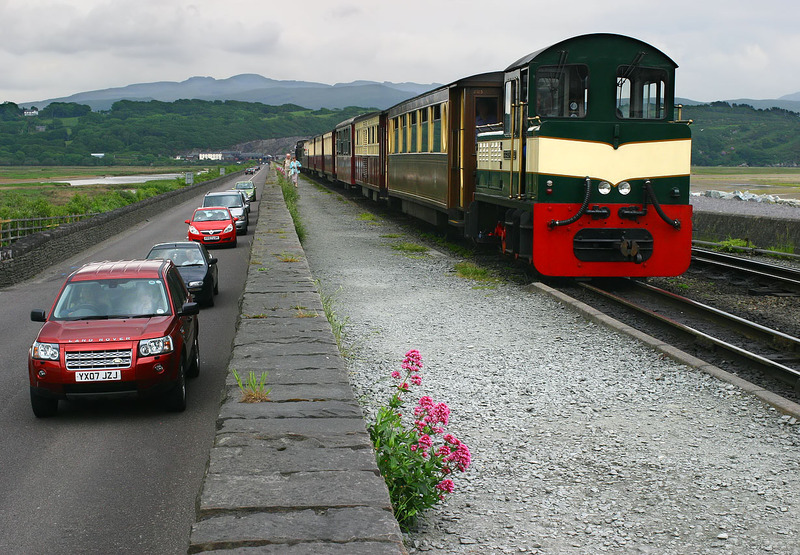 The Ffestiniog Railway's 0-6-0 diesel locomotive Criccieth Castle draws the 12:55 train from Caernarfon into Porthmadog station, whilst motorists travel at roughly the same sedate speed as they arrive at the town. The Welsh Highland Railway's Garratt locomotive No. 87 is on the rear of the train, which must perform this reversal in order to enter the station. The single Valerian plant growing from the wall in the foreground adds some colour to the scene.